I had not been in the Temple Church for over 45 years. 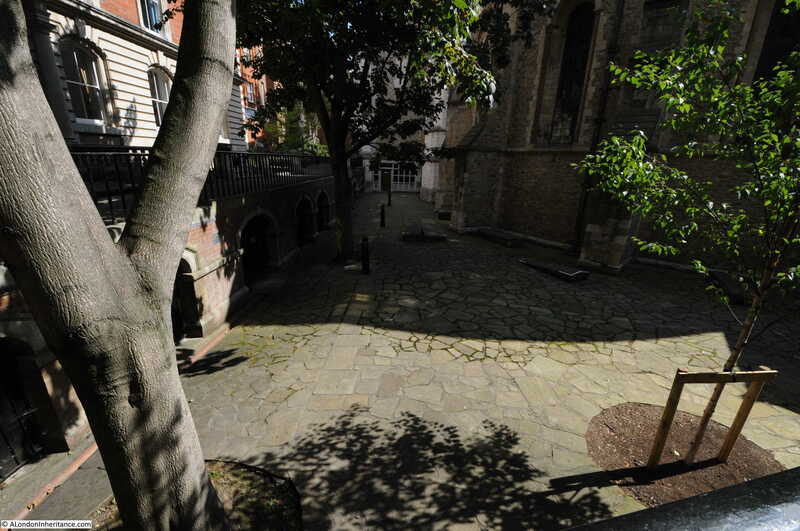 It is a place I have wanted to visit again, however until this summer, I had not made the effort to turn off Fleet Street and walk down the alley when the church was open. The time of my last visit was as a small child, on one of the many London walks with our parents. My memories of the church are of a dark, mysterious interior – a black and white vision of the church. memories probably distorted by a child’s view and the passage of time. 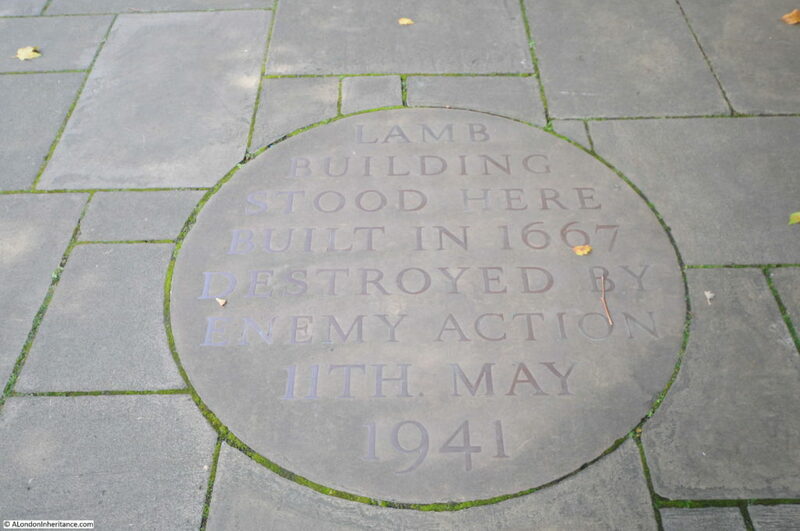 Finally, this year, on a glorious summer day (good to remember just after the shortest day of the year), I did turn off Fleet Street and walk down the short alley to the Temple Church to see if it was the same as the vague memories of my only other visit. 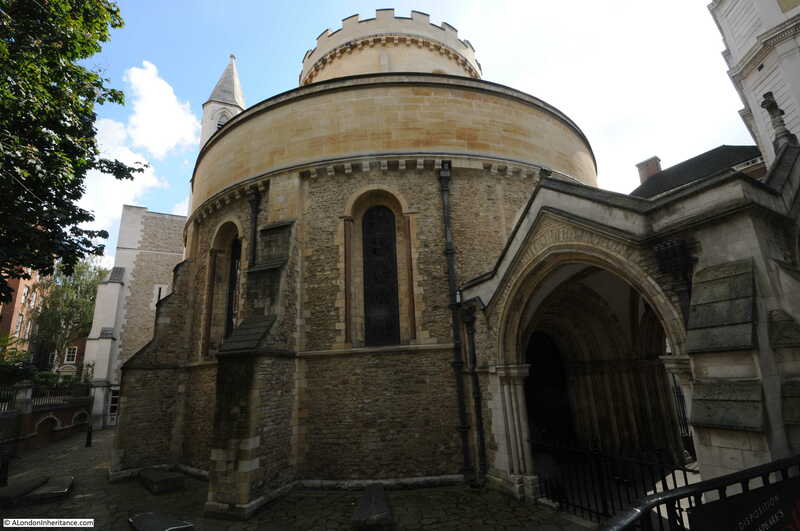 The Temple Church was built by the Knights Templar in the 12th century and the round tower was consecrated by Heraclius, the Patriarch of Jerusalem in 1185. 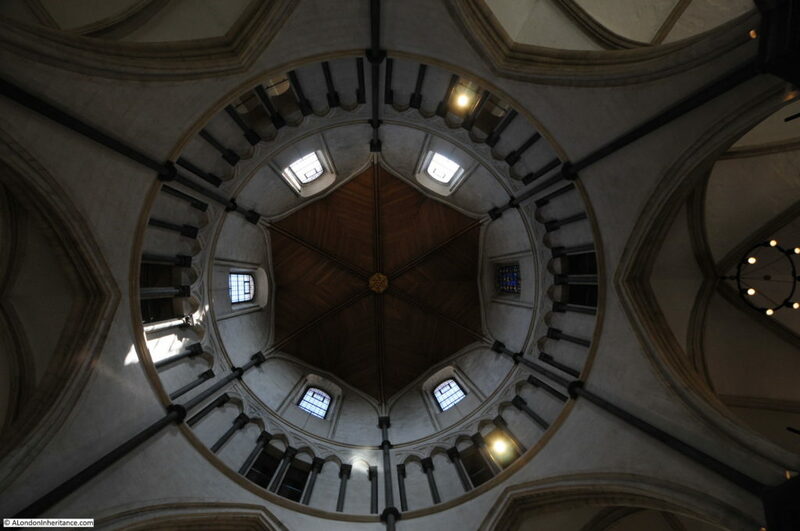 The design of the round tower was intended to resemble the Church of the Holy Sepulchre in Jerusalem. The chancel was added in 1240. 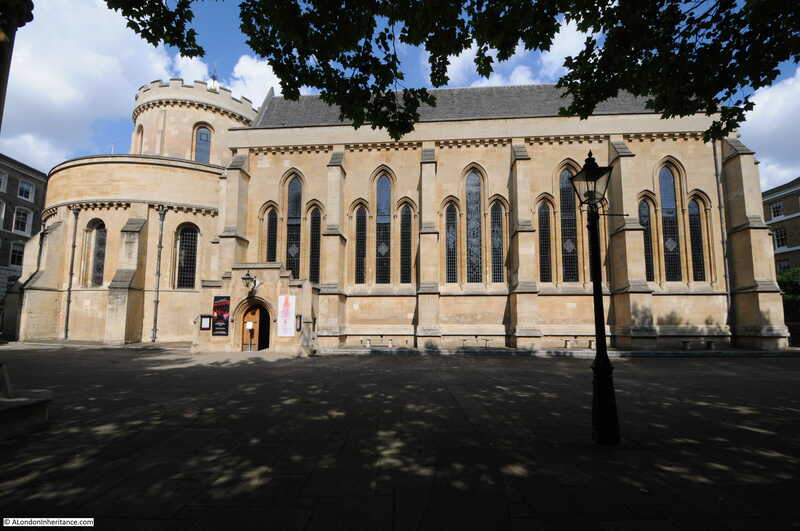 The Temple Church is a Royal Peculiar, this is a church that belongs directly to the monarch, rather than belonging to a diocese as with a parish church. 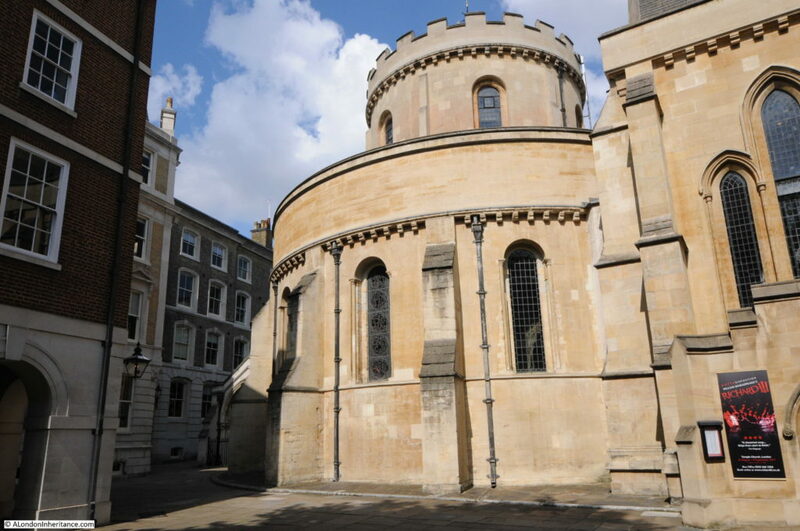 The lead member of clergy in the Temple Church is called the Master of the Temple, a reference to the head of the order of the Knights Templar. Despite the 12th century origin of the church, it has undergone so much “restoration” over the centuries, including major 19th century works, that there is a very little of the original church left. 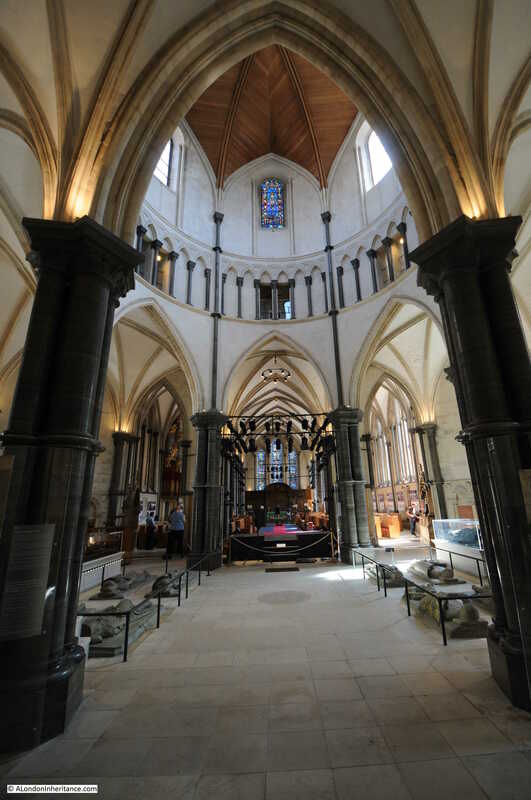 The Temple Church was also very badly damaged during the last war which required considerable restoration and rebuilding work. Writing in The Bombed Buildings of Britain (the Architectural Press) in 1942, John Summerson stated “The Temple Church is a building which has suffered such dreadful ‘restoration’ that hardly one visible stone of it can be certified as older than the first half of the 19th century”. More repairs were carried out in 1737 to the north and eastern sides of the church and in 1811 more general repairs were made. 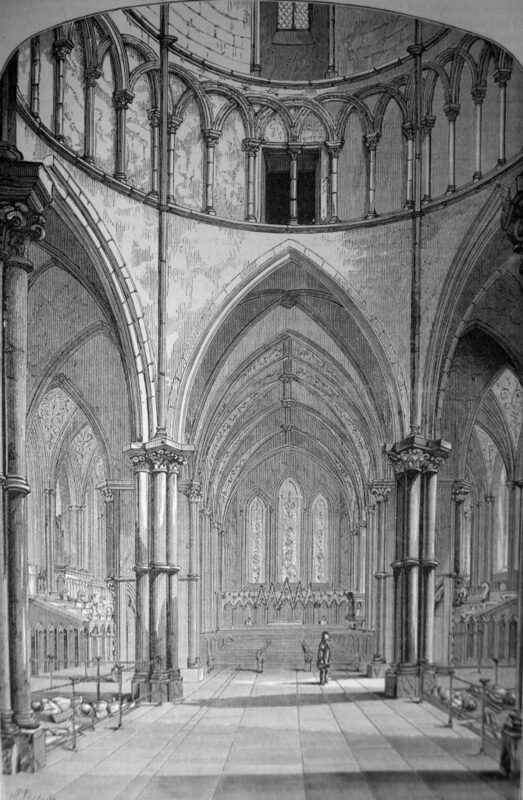 More extensive repairs were carried out in 1825 to the south side of the church and the lower part of the round tower and the earlier wainscoting was removed. Further repairs and restoration began in 1845 to remove much of the earlier “beautification” and included the lowering of the pavement back to its original level. The whitewashing was also been removed. 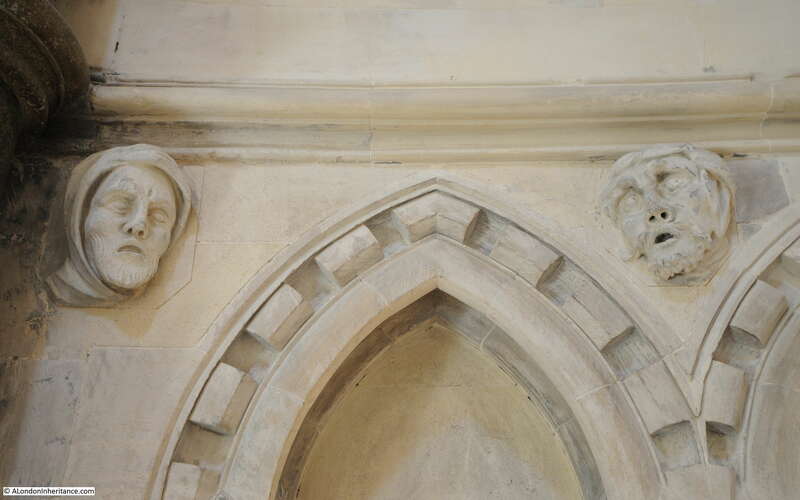 19th century repairs including refacing much of Temple Church using Bath stone. 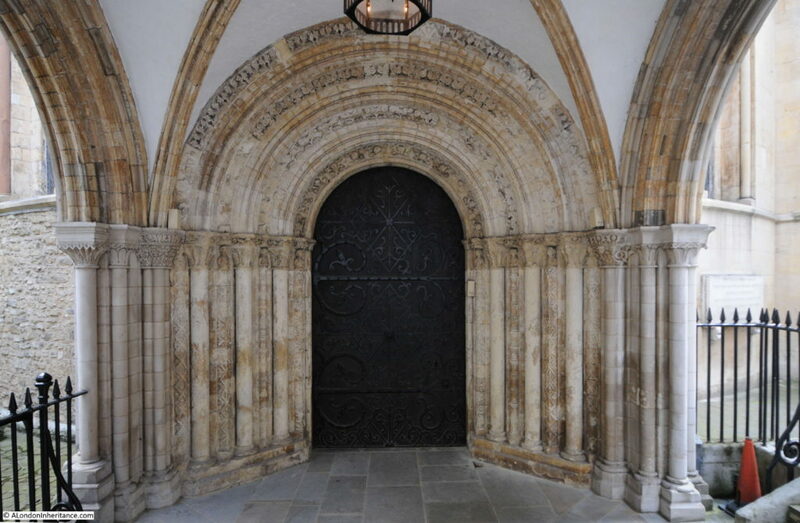 One of the few parts of the Temple Church which does appear to be part of the early build of the church is the magnificent western doorway to the round tower. The difference in colour shows the difference between original and Victorian restoration – the lighter coloured three outer pillars on each side are Victorian, the inner columns are original. 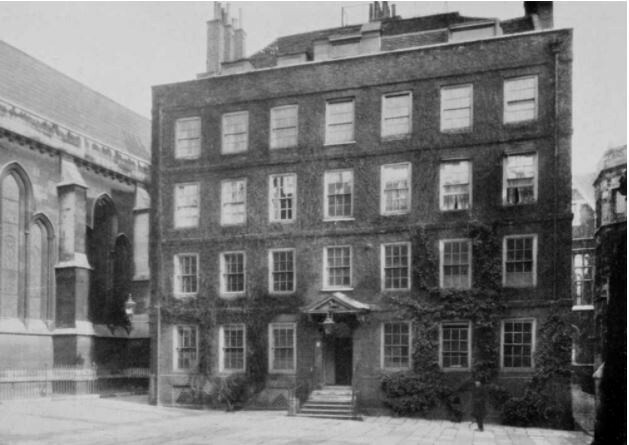 The Lamb Building as it was in the 1920s is shown in the photo below. A wonderful building, damaged to the point where it could not be rebuilt. The photo also highlights how close buildings were constructed up again the Temple Church. 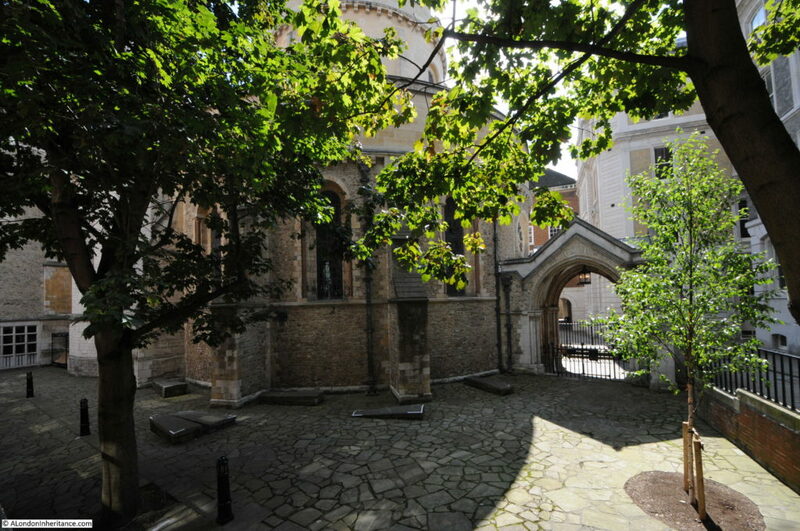 The following photo is looking across from Middle Temple and shows the Temple Church in the centre between the large hall on the right and the buildings on the left. Both the Temple Church and the hall have lost their roofs and have been reduced to shells of buildings with only their outer walls remaining. The problem I find when researching these posts is that I almost always find related interesting topics to read more about. 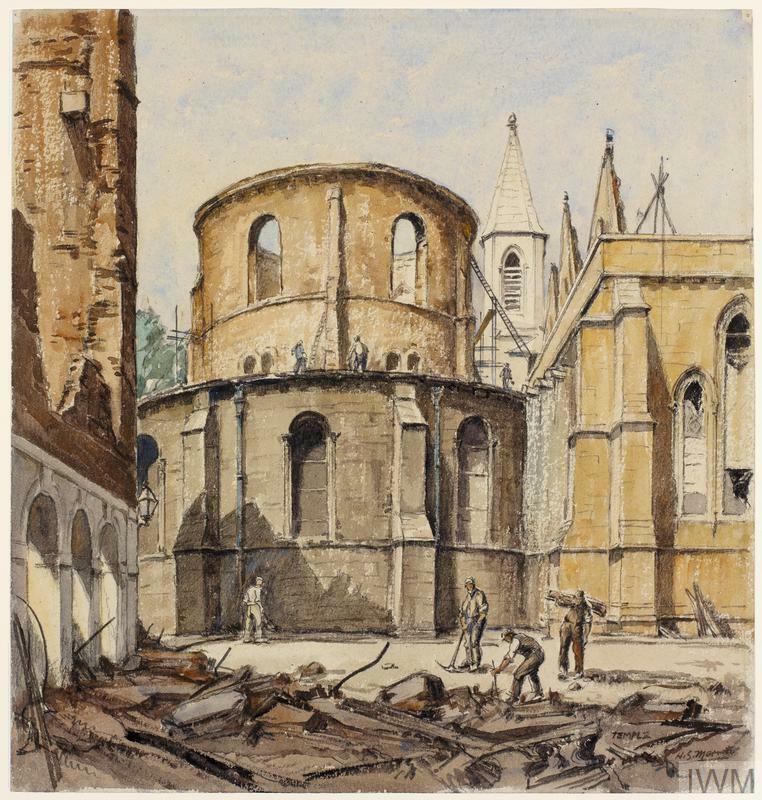 For the Temple Church, I was looking in the Imperial War Museum archives and found a couple of paintings of the Temple Church made by artists working under the War Artists Advisory Committee (WAAC). The WAAC was formed in 1939 and led by the National Gallery Director, Kenneth Clark. The aim was to create an artistic record of the war, and during the course of the conflict over 400 artists had worked on the project, creating around 6,000 works of art. 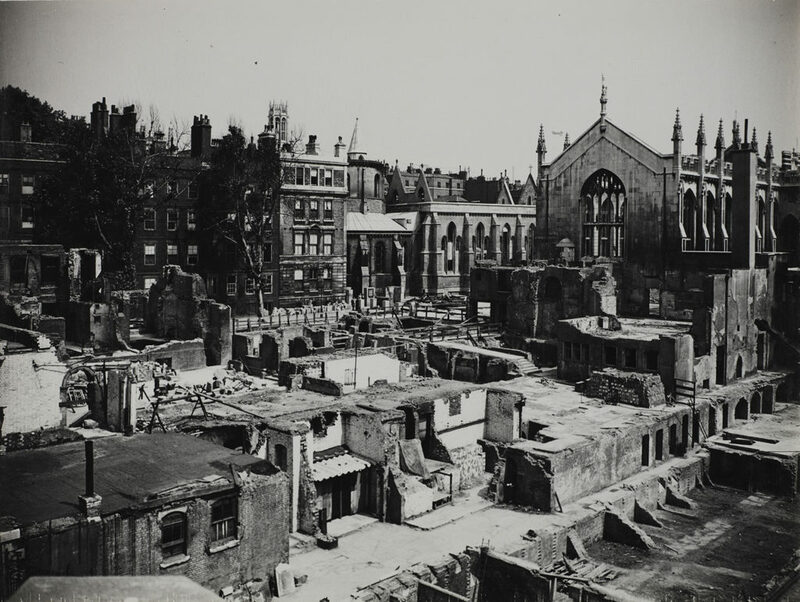 I plan to write a future post on the War Artists Advisory Committee – it is a fascinating body of work and portrays a different aspect of the war across London to the photographic record. These pictures illustrate the level of post war rebuilding that was needed to restore the church to the standard we see today. Having walked around the outside of the church it was time to take a look inside and see if the church resembled my black and white memories of the church from my first visit. Walking through the door revealed a very different church, bright, colourful and showing the incredible amount of effort that went into restoring the church from the wartime shell. The effigies suffered significant damage in 1941. The roof of the round tower collapsed onto the floor below and fires consumed all the woodwork in the church. 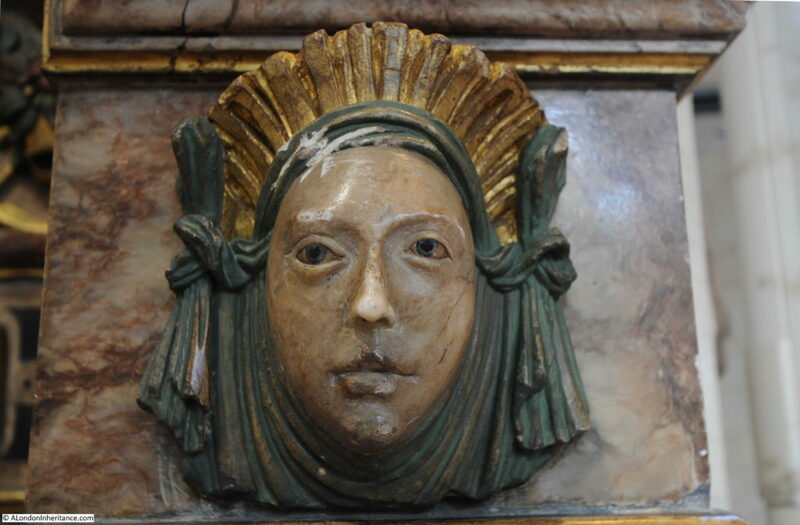 As with the rest of the church, the effigies also required significant post war restoration. 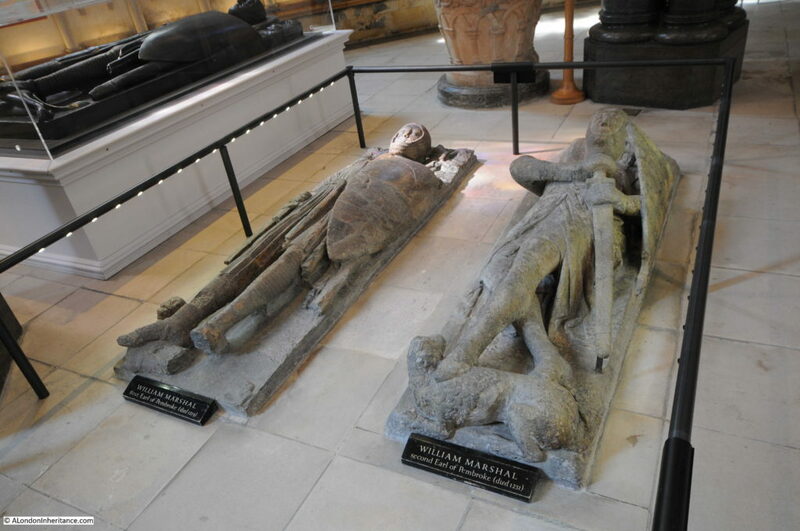 Some of the effigies are named, although most of the reference books I have read covering the Temple Church refer to the naming as “said to be” so I suspect that due to the centuries that have passed, the periodic restoration and rebuilding of and within the church, we cannot really be sure that the effigies are named correctly. The first Earl of Pembroke worked between King John and the Barons during the negotiations that ended with the Magna Carta. His son, the second Earl of Pembroke was one of the Surety Barons at Runnymede. They were both buried under the round tower. There are a number of carved heads in the triangular spaces (spandrels) either side of the top of the arches around the edge of the round tower. There are differing opinions as to whether any of these are original or later recreations. Simon Bradley and Nikolaus Pevsner writing in “London: The City Churches” state that the heads were renewed by Robert Smirke during one of the 19th century restorations. 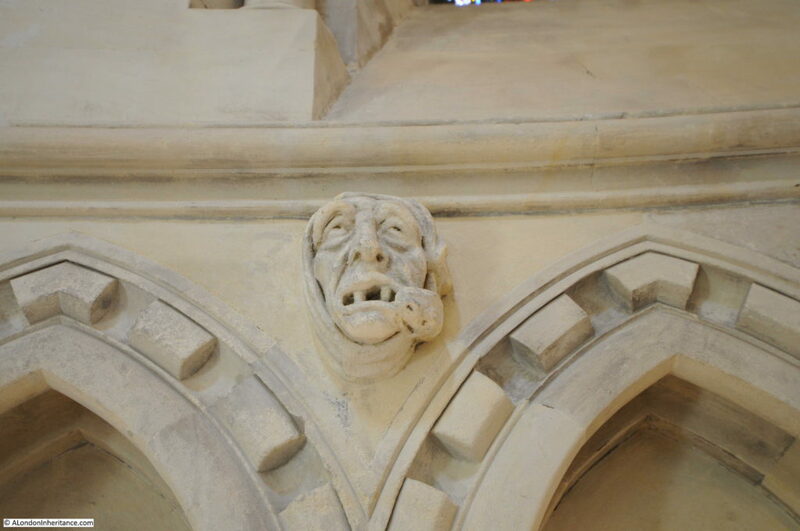 Whatever their actual age, they do recreate typical medieval grotesques, caricaturing people, animals and mythical beasts. 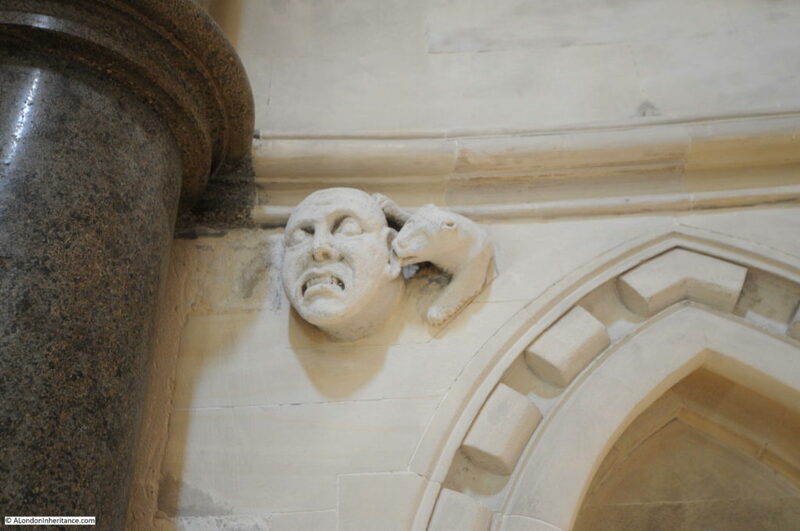 Including combinations of people and animals with this rather painful looking biting of an ear. Plowden was born in 1519 and was a notable English Lawyer. 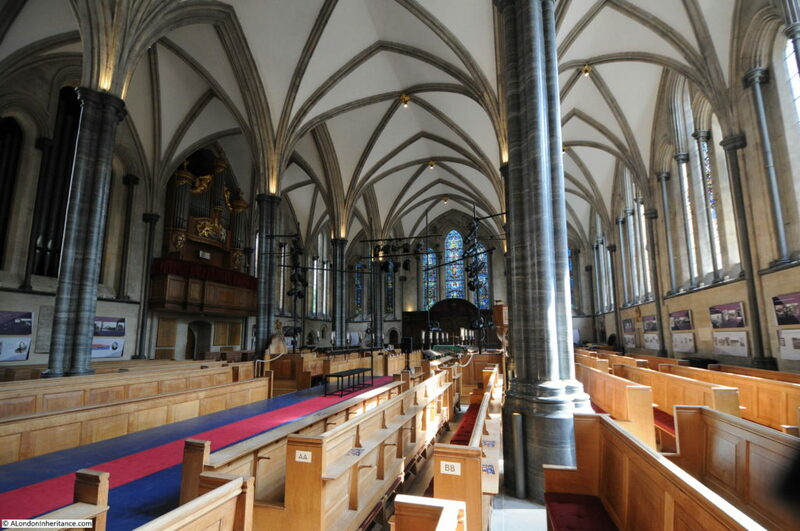 As well as through the legal profession, his connection with the Temple Church was his role as Treasurer of the Temple Church from 1561 to 1570. 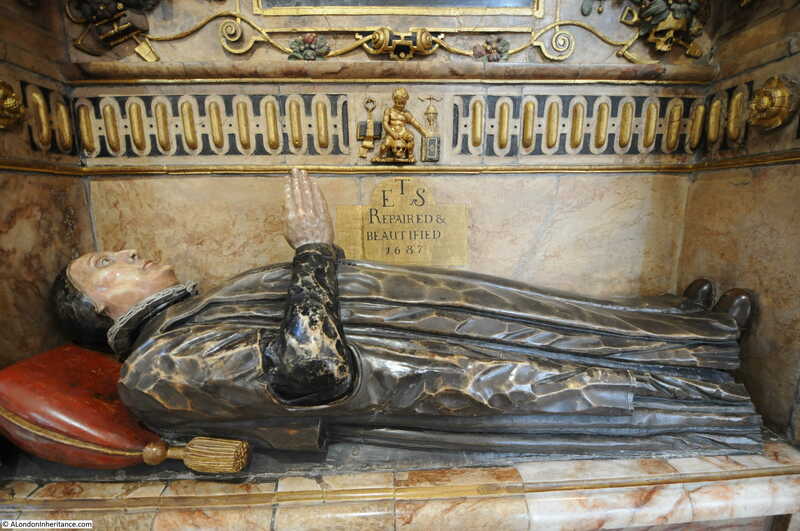 He died in 1585 and following his directions, he was buried in the Temple Church. 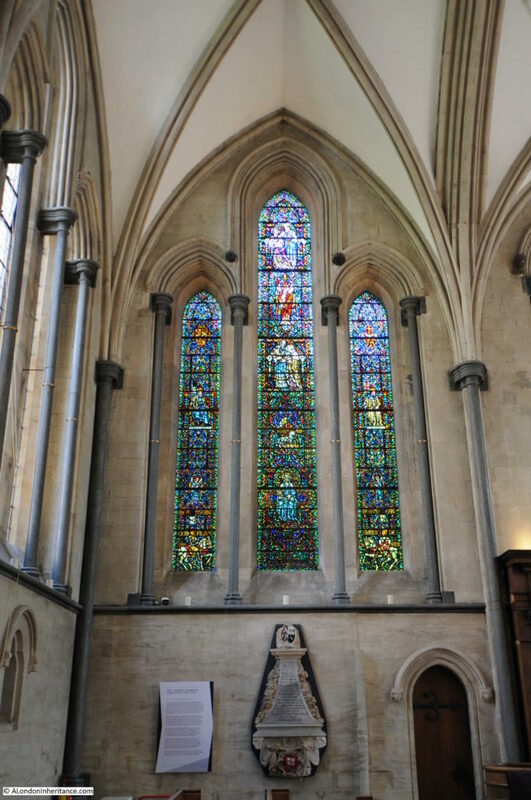 The post war rebuild of the Temple Church was significant, but was mainly completed by the mid 1950s, with stained glass being completed towards the end of the decade. 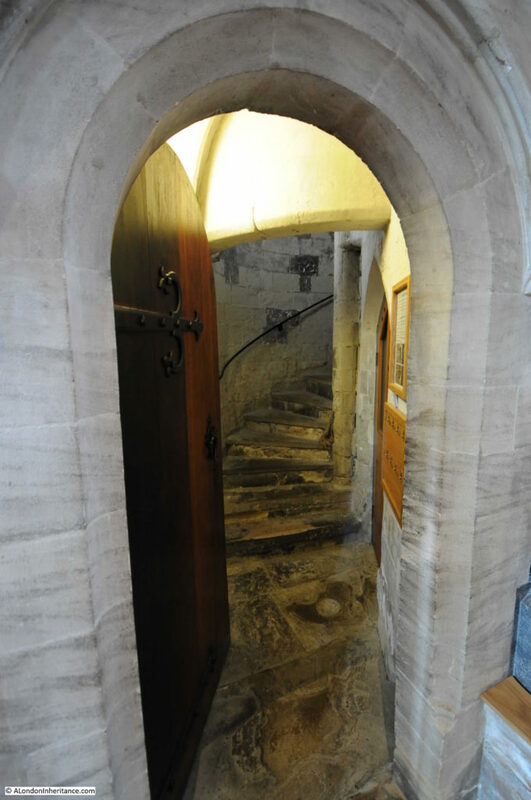 There is a door at the base of the round tower with steps that lead up to the triforium which runs around the circumference of the round tower. 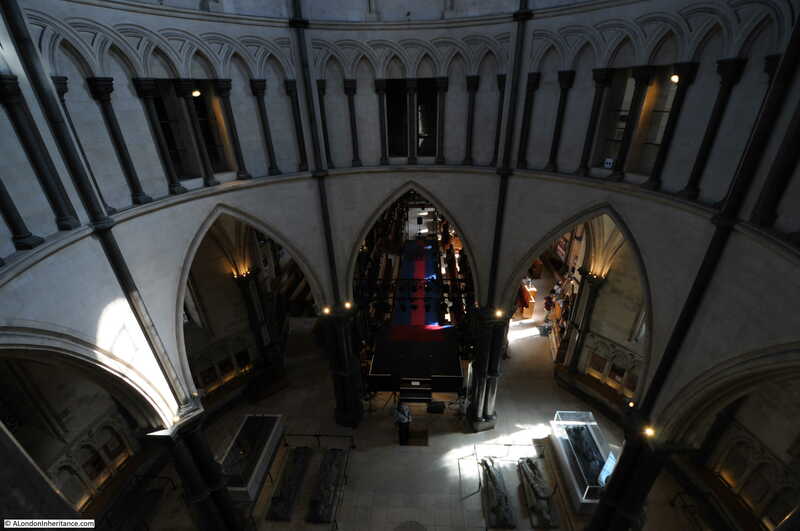 Whilst there is very little left of the original church, and the building has been through so many restorations and rebuilds, perhaps the key point is that whilst the fabric has changed, Temple Church maintains the original layout, which includes the important and rare round tower. The Temple Church also provides a tangible link with the Knights Templar (who have been the subject of some fantasy writing and theories over the years), along with the Magna Carta and the legal profession of the surrounding Inner and Middle Temple. 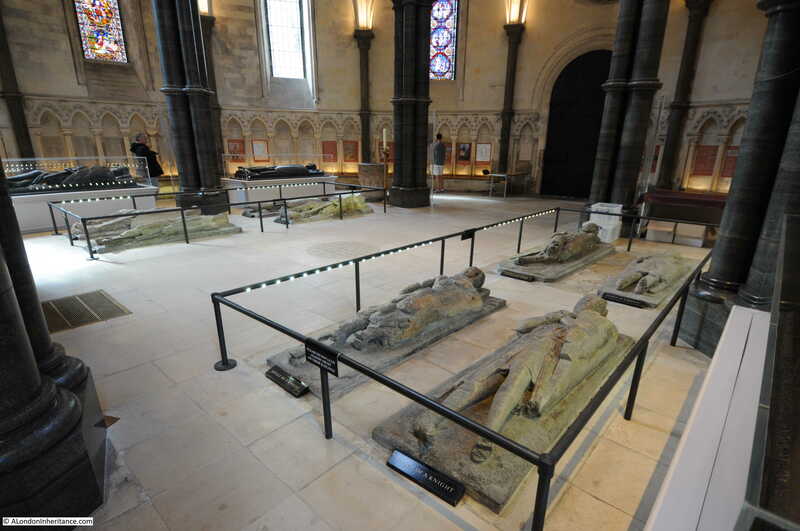 I found the Temple Church to be very different to my distant memories of the place. Far from having a dark, black and white interior, the church is bright, colourful and fascinating. 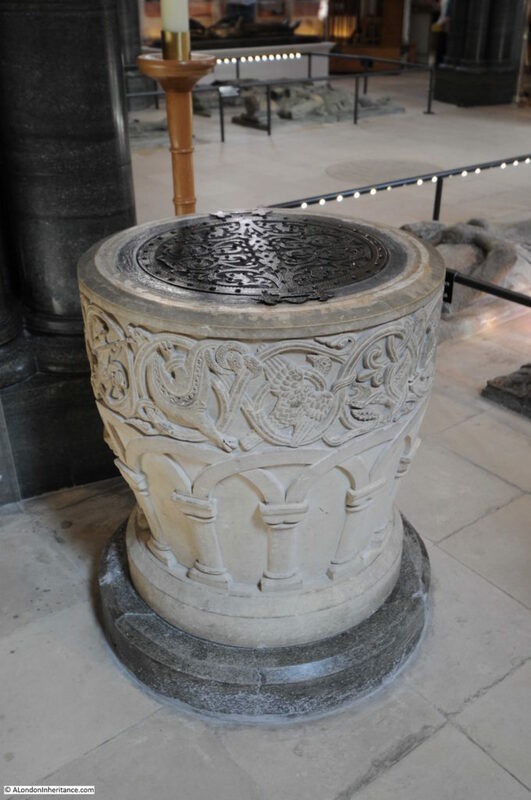 This entry was posted in London Churches and tagged Knights Templar, Temple Church on December 24, 2017 by admin. Fascinating post as always, really enjoyed this! Thanks, Merry Christmas! Most interesting, I have known the church very well for over fifty years. I have often wondered when, or if the carved decoration of the west, c.1185 doorway beneath the porch is original or has been restored. Parts of the mouldings have disappeared. The porch itself suffered blast damage in 1940-41. 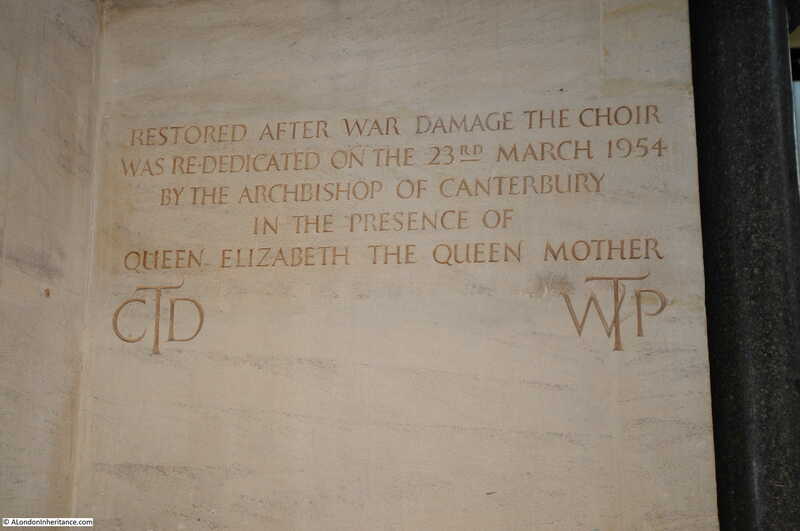 Thanks for the comment Hubert – I did wonder about the porch as the damage was so bad to the rest of the church, and agree it is a haven of peace. A pleasure to walk from the noise and traffic of Fleet Street to the Temple. I have often wondered if and when the moulding of the west doorway of c.1185 is original or restored? Parts of the mouldings have disappeared. The porch suffered blast during the raids of 1940-41. I have known the church since its restoration in the 1950s. 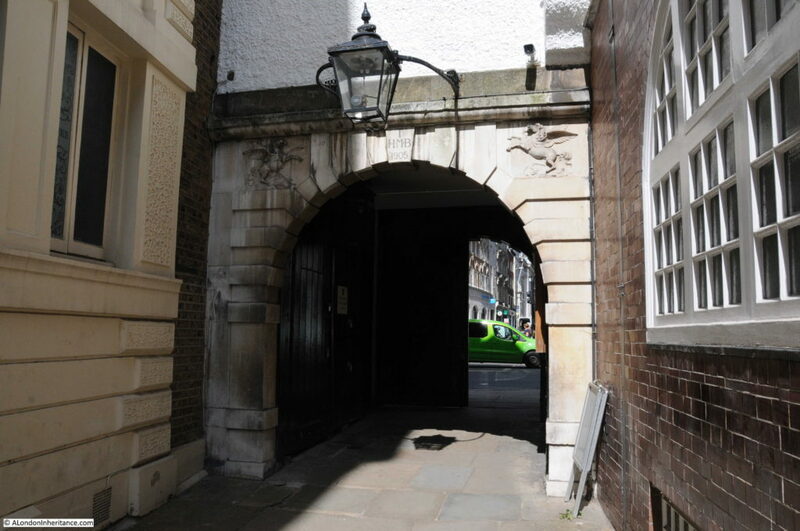 Inner Temple is a haven of peace so I often walk there and in Middle Temple. Thank you once again for such interesting and informative posts – and Happy Christmas! Thank you Anne, and for your comments over the past year. A very Happy Christmas. Wonderful piece. Especially liked the war artists’ pictures. Thanks for that. Wishing you a Merry Christmas and a great New Year with lots more blog posts on London’s history. Thanks Baldwin and for your comments over the past year. A very Happy Christmas. It has been almost 40 years since I last visited this church and, like you, my memories are of something quite different. Time to go again. Many thanks for all your posts throughout the year; they are what I look forward to every Sunday morning with my cup of coffee. Have a very merry Christmas indeed. Thanks Annie, really appreciate your kind comments. A very happy Christmas. Many thanks for this posting. As with you other postings, this one was full of interesting stories and images. May I please query the title of the third of the Imperial War Museum paintings? 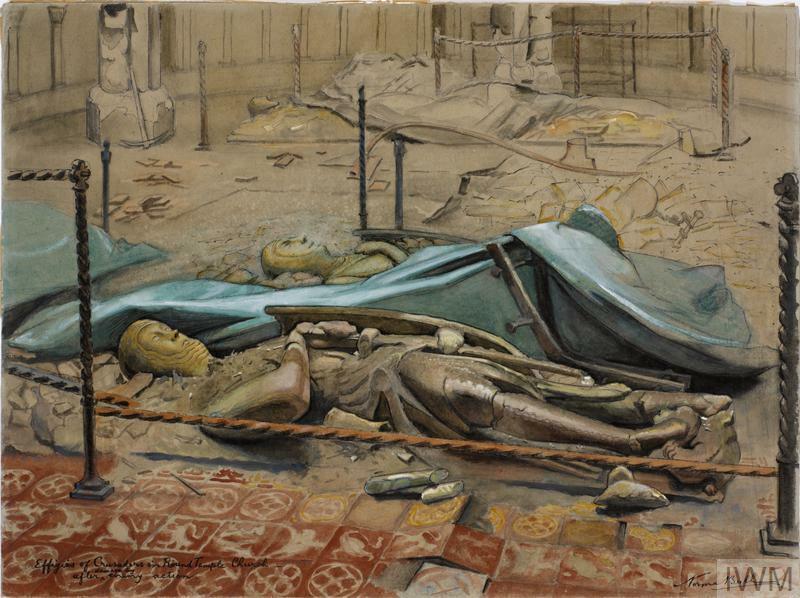 It is not your error, but I think the IWM may have attributed the painting as being Temple Church, whereas I believe it may be the City Temple church that was built on Holborn Viaduct in the late 19th century. If you look at the painting, there are none of the stone columns of the Temple church seen in the photos you took, and the windows are classical round headed ones, not pointed Gothic windows. What does anyone else think? With best wishes for a peaceful and joyous Christmas. Christopher – I suspect you are right about the third painting. I took the IWM description as correct. I am researching the WAAS in more detail so will see if I can find confirmation. Thanks for the feedback and a very happy Christmas. 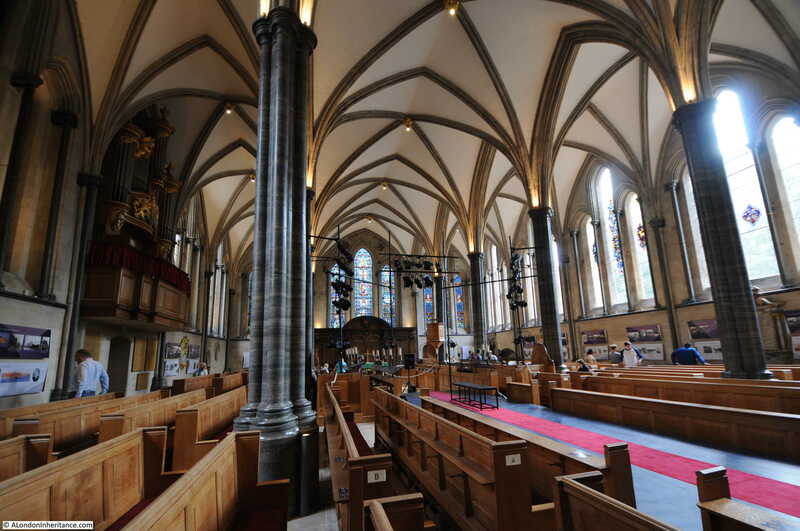 The IWM page – http://www.iwm.org.uk/collections/item/object/21827 – is headed “The City Temple Church, London, EC4”, but then confusingly mentions Temple Church, Temple. 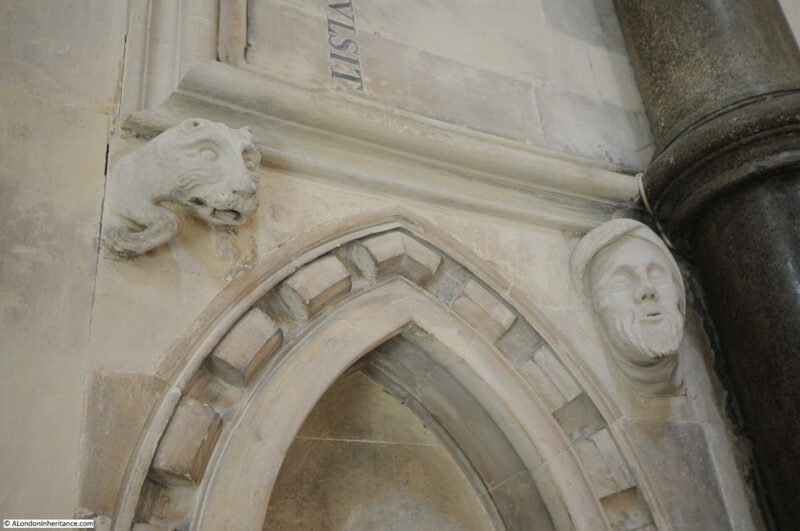 It is fairly clearly the church on Holborn, not the one off Fleet Street. Thanks Andrew – I will be updating the post. I’ve visited the church but didn’t learn half as much about it as I did from this post. Many thanks. After many failed attempts to visit over the years (with the church being closed for various reasons) I finally managed to visit it myself this summer. The choir happened to be practicing at the time too which made the visit all the more special. Fascinating to see the war artists paintings. Thanks for all your posts throughout the year, looking forward to reading more throughout 2018. In meantime, wishing you a very Merry Christmas! I bought a mounted and framed watercolour of the interior of the Round with the effigies of the knights a few years ago. It is signed Ch. Harding and looks to me to have been made in about 1900. It was priced at £20 and simply titled ‘church interior’. I recognised it immediately. The draughtsmanship and handling of washes suggests very much a professional artist. Does any one know of this artist; I suspect he painted more churches in London, or perhaps buildings within Inner and Middle Temple. I wonder if the Artist was Chester Harding. I have no idea of his Christian name. Can you therefore tell me more about this artist; did he paint other scenes within Inner or Middle Temple or elsewhere in London? I assume he was painting at the end of the 19th century? I finally managed to visit the church in December 2013, after trying off and on for over a decade on occasional trips to the UK. Even then, when we arrived, the church was about to close for the lunch hour due to a lack of staff to oversee visitors. I’m so glad that I did get to go inside at last, and your post refreshed my memories and taught me more about the longer history of the building. Thank you! Hello. I will be in London in October for a few days and I hope to visit the Temple Church. 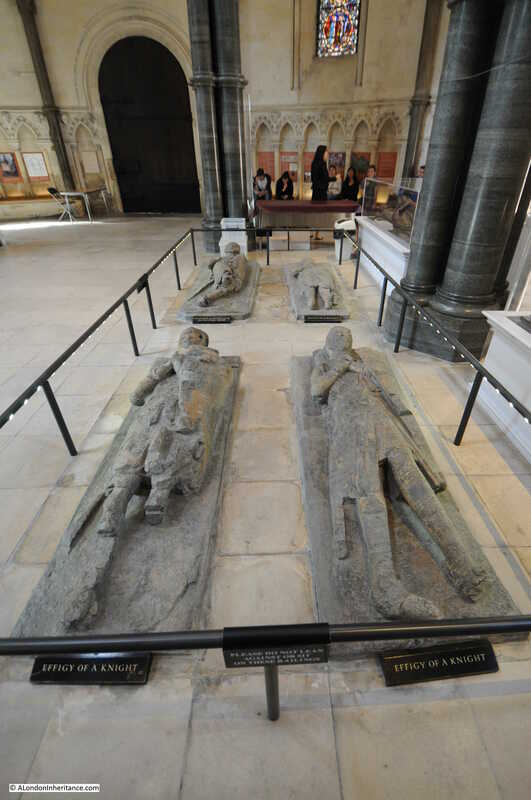 Are there any other significant Templar sites or Graves in London to visit. Perhaps you may know of a website? I look forward to your email newsletter every week.